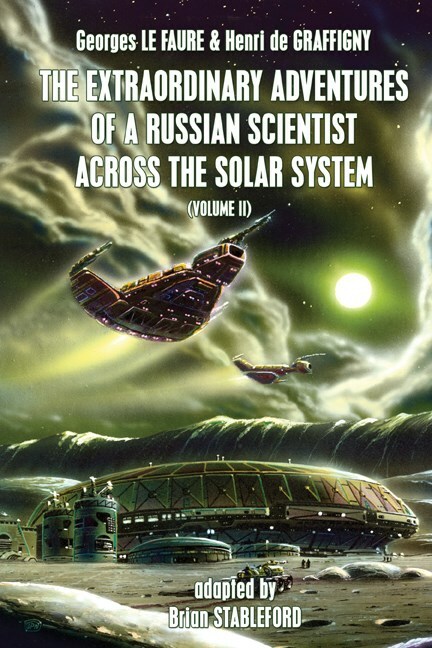 The Extraordinary Adventures of a Russian Scientist Across the Solar System is an ambitious Vernian cosmic saga written between 1888 and 1896 by Georges Le Faure and Henri de Graffigny. Where Verne had limited his hero Hector Servadac to traveling on a comet, Le Faure and de Graffigny tell the detailed story of the exploration of the Solar System -- and beyond. "We have traveled," said Fricoulet, quite placidly, "four billon kilometers in a little more than 30 hours." "But where are we?" Gontran groaned. "Something like 1.2 thousand billion leagues from our own Sun," the engineer replied. "For I'm certain that the exceptionally bright star visible behind our ship is the center of our Solar System."